Home Dogs Dog eating Cat food – How to prevent it? Most dogs like to eat, I mean a lot! Sometimes we can’t stop wondering because a dog with a weight of about 30lbs seems to eat as much as a full grown human adult would. Dogs often find cat food more appealing than their own kibbles. Why so? First, there is a difference in nutrition when comparing dog food with cat food. Food that’s made for cats have way more protein – a higher percentage of meat which may be one of the causes. Your dog also might want some extra food because of improper scheduled feeding. At the end, there are a ton of reasons with many answers, but for most, it’s just because they are dogs and food in their eyes is and stays food. Therefore in this article, we will learn how to stop your dog from eating at food and can it do any harm for your barking friend. The first is the most reasonable thing to do – training your dog. With a proper training, your dog will know that it can only eat from its own bowl. This can be done similarly as training your dog not to take food from the ground. Placing your cat’s bowl somewhere higher where your dog can’t access it is a superb and easy solution. All it takes is placing the bowl in a different location and that’s it. Cat’s are natural climbers, they can jump and climb there where your dog never could. A good idea is placing a bowl with cat food on a cat tree or a large enough shelf where your cat can climb safely. Not only dogs can have scheduled meals. We advise feeding your cat and dog at the same time so they are busy eating their own food. To make it more effective, feed each of them in different areas. Scheduled feeding is a way to go. At last, you can use a pet gate or doors so only your cat gets to pass it. In the result, a dog won’t be able to access cat’s bowl. What if my cat eats dog food? In most cases, this isn’t anything to worry about as all premium dog foods will be just fine for your cat, even for yourself. If your cat steals a kibble or two once in a while, it’s completely normal. However, with time this can develop into a habit and there is a risk of obesity. One thing to note is that you can’t feed your cat with a dog food alone. As we already learned there is a difference in nutrition. Dog food lacks some vitally important things for a cat like taurine and A vitamin as well as has lower protein levels. All these three things are very important for your cat to be healthy. Are there any health concerns if my dog eats cat food? To calm you down – in most cases there will be no complications from a dog eating cat food. 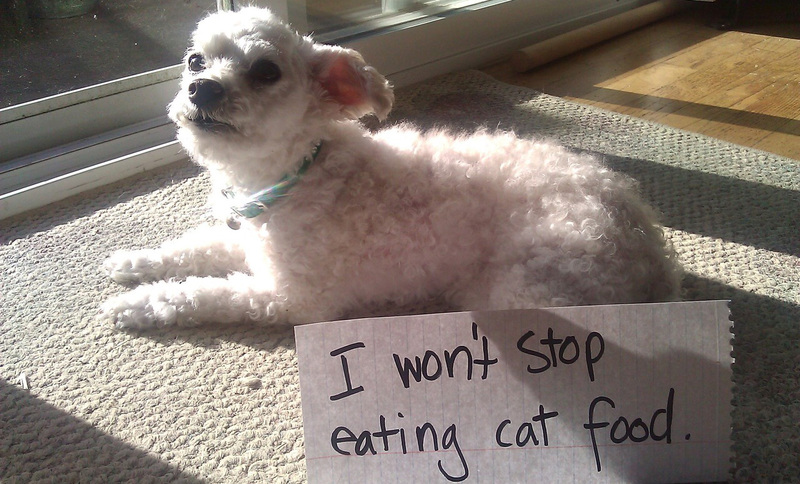 Dog’s eat some cat food all the time. By the way, you may feel free to give your dog a small pack of cat food if you have one laying around. However, all dogs are not the same and some may have some symptoms like vomiting and diarrhea especially if they eat cat food in large amounts. To cure this, just limit your dog from accessing cat food with one of the methods shown above. Cats are carnivores. Felines have a very protein oriented nutritional needs. Dogs on the other hand, just like bears are more omnivores despite being classified as carnivores. They will do the best with starch-rich diet. For a healthy cat, it’s vitally important to have taurine and amino acids in their diets. Both of these can be found in animal flesh. Dog’s can do just great with a diet that contains less protein and their bodies can produce amino acids from vegetable oils. A sudden large dose of protein can cause your dog to feel sick. However, in long term, a great amount of protein can be hard for your dog’s liver. Another thing to mention that large amounts of cat food can build up fat, especially if your dog lacks exercise. This can lead to obesity. Kitten food is more harmful of all as it has an extra high dose of protein and fat. You can learn more about dog diet in our Why dogs are carnivores and the appropriate HP-LC diet article. At the first sight dog and cat food might seem the same, but if we take a closer look, we will see that they are completely different. Eating few kibbles of cat food won’t harm your dog. However, if this happens regularly, you should use some solutions and bits of advice mentioned above. In long term, cat food usage with its protein-dense nutrition can make it hard digestible and upset your companions stomach. Unlike cats, dogs don’t need so much taurine and can create their own arachidonic acid. Research has shown that dogs can digest starch-rich diet as they are domesticated over the years. So to make it simple – if your dog consumes cat food in large amounts, you have to find a way how to stop this. However, eating few chunks of food that are meant for your cat won’t do any harm.